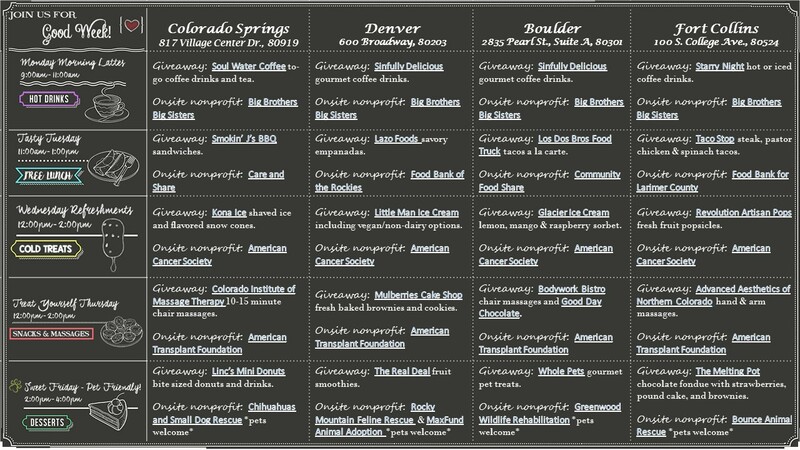 FirstBank is launching “Good Week” where the following branch locations, across Colorado, will be providing “acts of goodness” (free food, drinks, services and a chance to donate to various charitable causes), starting Monday, July 24th through Friday, July 28th. The ultimate goal of Good Week is to make kindness contagious and encourage folks to give back. Monday Morning Lattes: Free gourmet coffee drinks from 9:00 a.m. to 11:00 a.m. courtesy of Soul Water Coffee, Sinfully Delicious Catering and Starry Night Cafe. Tasty Tuesday: Free lunch from 11:00 a.m. to 1:00 p.m. courtesy of Smokin’ J’s BBQ, Lazo Foods, Los Dos Bros Food Truck and The Taco Stop. Wednesday Refreshments: Free ice cold treats from 12:00 p.m. to 2:00 p.m. courtesy of Kona Ice, Little Man Ice Cream, Glacier Ice Cream and Revolution Artisan Pops. Treat Yourself Thursday: Free snacks/drinks or massages from professional massage therapists from 12:00 p.m. to 2:00 p.m. courtesy of Colorado Institute of Massage Therapy, Mulberries Cake Shop, Bodywork Bistro, Good Day Chocolate and Advanced Aesthetics of Northern Colorado. Sweet Friday: Free bite-sized sweets for human and furry friends from 2:00 p.m. to 4:00 p.m. courtesy of Linc’s Mini Donuts, The Real Deal Food Truck, Whole Pets and The Melting Pot. Click the image to see the full schedule of Good Week activities. Along with providing free treats, we also want to take this chance to give to the community. The bank is partnering with several nonprofits to be onsite and share information about their organization, including: Big Brothers Big Sisters, Care and Share Food Bank, Food Bank of the Rockies, Community Food Share, Food Bank for Larimer County, American Cancer Society, American Transplant Foundation, Chihuahuas & Small Dog Rescue, Rocky Mountain Feline Rescue, Greenwood Wildlife Rehabilitation and Bounce Animal Rescue. Not all of your customers are close to the selected locations!! Not real good ‘Customer Appreciation’ when not all branches are included! Hi Sandi, while we do a lot of customer appreciation events, this is not one of them. It’s open to the public. Also, we do several events with various freebies/giveaways for customers across all our markets, including our Aurora branches. We apologize these events aren’t convenient for you. If you’re in Denver, swing by 6th and Speer and we’ll be more than happy to greet you with a free latte, lunch or sweet treat. Hi Greg, we do a lot of events throughout the year in multiple markets, where customers and even non-customers can partake in different freebies, giveaways and even charitable causes the bank is sponsoring. We apologize these events aren’t taking place at a branch near you. But we’d love to have you come down if you’re in the area. This is why I still bank with 1st Bank even though I no longer live in Colorado. Wish you would expand to NV. This is really nice for customers who live in the 4 cities listed. How about those of us in California?? As we stated in the blog post, we have plans to execute Good Week in Palm Desert, Calif. later this year. We haven’t forgotten about you! Check back for more updates. This is good for people who live and/or work near the four locations. That likely excludes over 95% of 1stBank Customers. My guess is the Denver location is being used to get customers to see if they can figure out how to get there. I live less than four miles from 600 Broadway and there are three other locations more convenient and easier to access. I love 1st Bank, but this is simply a marketing effort for these bank locations. This is a good will initiative intended to shed light on some truly wonderful causes. The free food, coffee, drinks, etc. are just a bonus to folks passing by. It wasn’t feasible for the nonprofits and local businesses hired to do this at 100+ locations. We selected these four locations because they were in easily accessible, high traffic and pedestrian friendly locations. It’s very possible that we may open this up to more locations in the future. We have tentative plans to do this at other branch location in and outside Colorado. We hope you stop by this week, get some free treats and learn about some truly amazing nonprofits. My husband and I love First Bank. We live in Palm Desert, CA, and have been with First Bank since 2002, when we moved here. We’re looking forward to First Bank having their Customer Appreciation Days here in Palm Desert. Thank you for being a great and honest bank. living in Longmont should I be thrilled that some dude in Colorado Springs gets a free coffee while I am bummed out and green with envy. Hi Don, we would’ve loved to do this at all locations, but couldn’t due to limitations with vendors, nonprofits, staff and volunteers. We apologize for the inconvenience. However, we have locations in Fort Collins, Boulder and Denver that are doing Good Week if you’re in the area. We’d love for you to stop by. There are TWENTY branches in Denver, and you’re only doing this promotion in one? Sure it costs more. But that’s the price you pay for customer satisfaction. Either you do it for everybody, or you don’t do it. Hi Chuck, this is a good will initiative intended to shed light on some truly wonderful causes. For this particular event, we worked with local nonprofits and businesses that couldn’t possibly staff 20+ locations. While we’d love to do this at all our branches, (and one day we might), it’s not always feasible. We do have plans to introduce Good Week at more branch locations in and outside Colorado later this year. Please check back for more updates. Sorry about all those complaints – there are many of us who appreciate what you are doing, whether it’s convenient for us to stop by or not! Keep up the good work! This the first time I receive an e-mail about customer appreciation and I have been with 1st Bank since 1990. There s nothing in Lakewood. What a disappointment!! Seriously considering putting my money in a credit union. We genuinely appreciate that you’ve been a longtime customer of ours. That is wonderful! While we do lots of customer appreciation events, this isn’t one. Apologies for the confusion. This is a good will event that’s open to the public and is intended to shed light on some truly wonderful causes. We apologize this isn’t happening at a location near you. In fact, we’d love to do this at all our 100+ locations, including your branch in Lakewood, and one day we might. But that just wasn’t feasible this time around. We hope you understand. Thank you for your patronage. I think it’s wonderful that the bank does ANYTHING for community. I’m not about to whine and complain just cuz it’s not happening in my market yet. Good will is good will. I hope everyone enjoys it that can. Jerry, thank you for your nice remarks. We really appreciate it. Do you think you will ever expand to Oregon? I opened my account in Arizona and now live in Eastern Oregon. Thank you. Hello Rodger, thanks for the comment and for continuing to bank with us from Oregon! We don’t currently have any plans to expand to Oregon, but never say never! Jim, that is so wonderful. We love hearing from customers who’ve banked with us a long time. We will definitely keep South Jeffco in mind for future events. If you find yourself near these locations, please come introduce yourself. We’d love to meet you. Maybe all the people leaving the negative comments should actually READ what good week is about! All I hear is… me, me, me, me! 1st Bank has these events to bring the public and local charities together so we can give to the less fortunate… Why does everyone feel so entitled? Thank you, Jason. So glad to see you understand what we’re trying to accomplish here. This is fantastic, I am thankful for a company who supports not for profit companies, and gives people a chance to do the same. I really like that your are working with the art project and giving young artists an opportunity to show their gifts and talents. I am very happy for the customers who get an opportunity to get something for free. I am sure they will be grateful. Thank you very much for your remarks and support. We genuinely appreciate it. Hopefully, we see you out this week at one of our participating locations. We always enjoy meeting our very kind and wonderful customers.